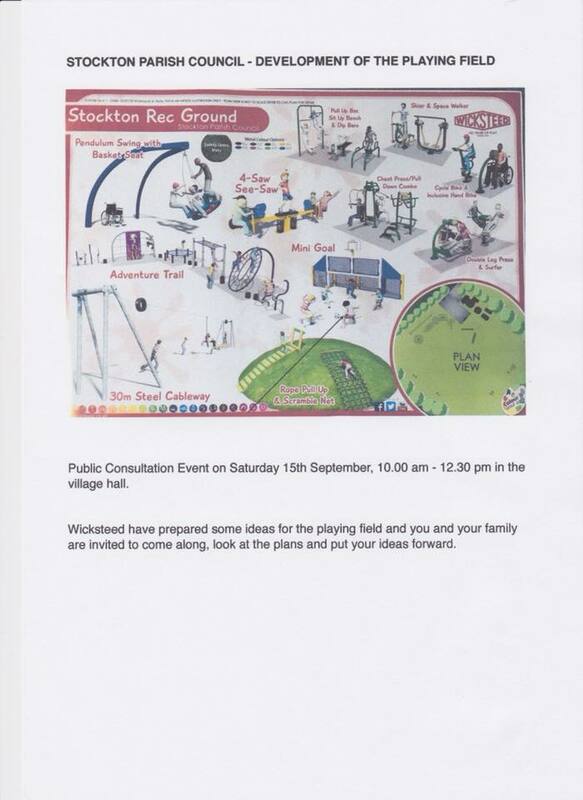 The Parish Council sponsored a walk-in session at Stockton Village Hall on Saturday 15th September to show some ideas for developing the Playing Field with a wide range of equipment. Wicksteed put together some suggestions and Stockton residents were given the opportunity to discuss the ideas and select their preferences. This will help the Parish Council to draw up investment plans. If you missed this session, please refer to the form below through which you can still register your preferences. In particular, we welcome the views of the younger Parishioners who will be the main users of any new facilities that we make available. Going forward, it would be beneficial for a Playing Field Committee to be formed, comprising Parents of these children, with full backing and support from the Parish Council. Please use the form below to indicate your preferences for investment in Playing Field equipment. Please choose three of the options to indicate your preference for investment in Playing Field Equipment.